Polypipe PVCu Power HV Class 1 cable duct are single wall cable protection systems for both unsealed and sealed systems, with sealed joints tested to BS EN 1277. PVCu Power HV cable duct is fully compliant with ENATS 12-24 Class 1 specification and can be used for low, medium and high voltage cable protection applications. 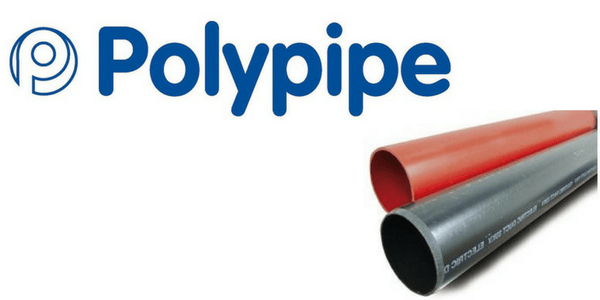 Polypipe PVCu cable duct is manufactured with outer diameters of 110mm or 160mm with 6m lengths as standard and in black or red and is supplied with an integral coupler. T&D offer a full range of LV, MV & HV power cable duct, contact us for further information. BS EN 1277:2003 is a British Standard for thermoplastic piping systems used within buried non-pressure applications and outlines three test methods for leak tightness of elastomeric sealing ring type joints which includes internal negative air pressure (partial vacuum), a low internal hydrostatic pressure and a higher internal hydrostatic pressure. T&D also supply duct seals which are able to provide a durable seal against high pressure water ingress into MV-HV substations and cable entries into buildings. 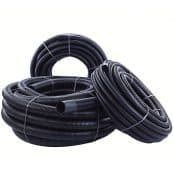 T&D distribute an extensive range of cable duct seals including Filoform, CSD and Roxtec cable transits. Note: Bends for sealed systems are plain ended, bends for unsealed systems are single socketed.